reporting tools. With real-time data, you can remove the blindfold and make smarter, informed decisions. iTab’s beautiful, built-in analytics dashboard provides business-critical data on your smartphone, iPad, or PC in real time – up to the second! Enjoy peace of mind that business is going as planned, even when you’re out and about. 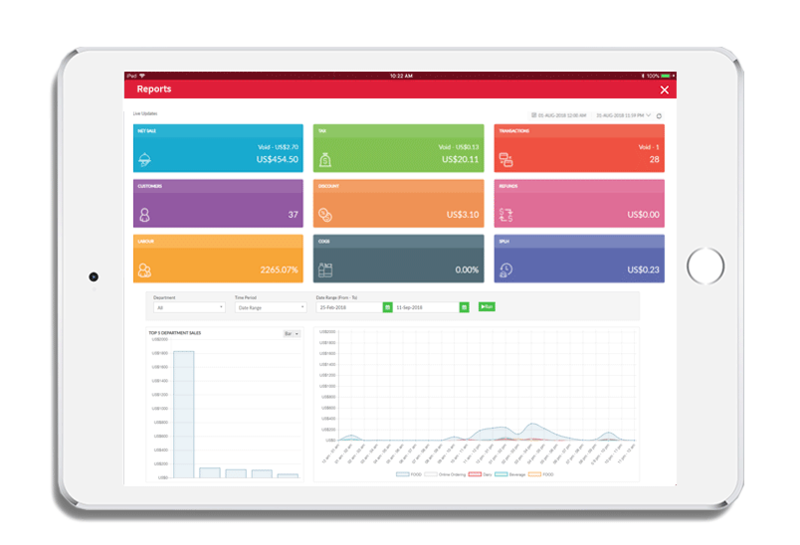 Get reporting on sales, expenses, inventory, product and store performance, labor, and more. 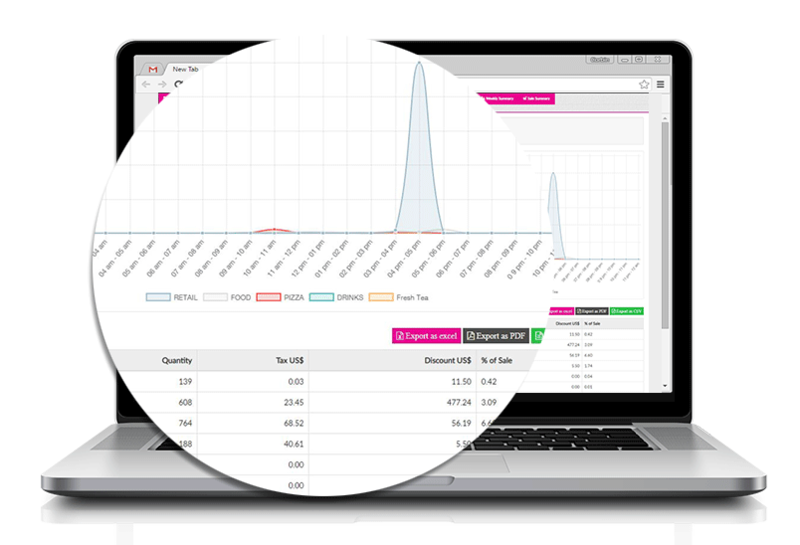 Leverage Product Mix Reports and Hourly Sales Reports to identify your best selling products as well as those that aren’t doing so hot. 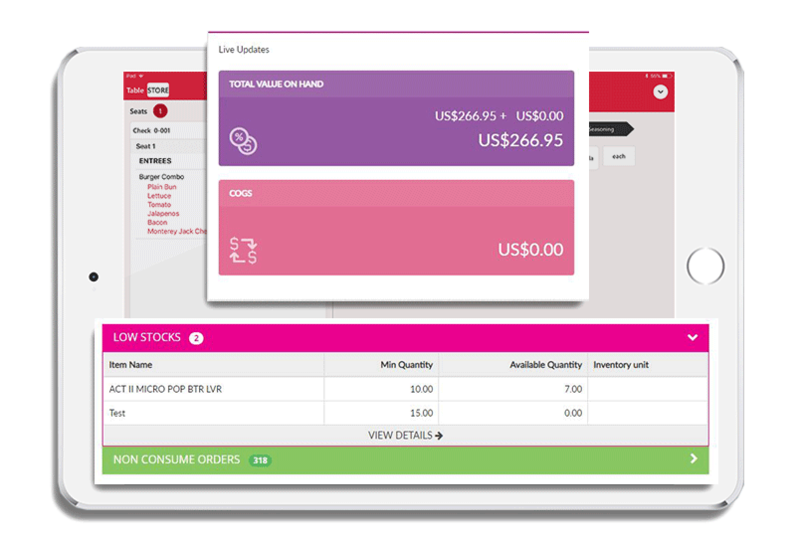 Since you can customize your product categories, the report can be customized to your parameters as well. Track your spending on an ingredient-level. Keep a real-time view of your available inventory, and proactively restock inventory to maintain ideal levels. You can also see which items are not turning over quickly enough to reduce waste and reduce costs. Track employee hours for the day or week along with their salary to calculate your labor costs and process payroll. Cut down the manual work and export payroll reports to Excel or .CSV to send to your accounting software or HR department. A full web-based office backend for creating menus, employee management, hardware set-up, reporting and more. Sync with your iPad to view changes in real time. View and manage your inventory settings and list from one place. Make adjusts, import new products, and manage suppliers with ease. Get better insights to make better decisions making with our customizable dashboard. View a number of reports and graphs for your product mix, register summaries, sales reports, employee activity and attendance, as well as inventory reports. Account information, loyalty programs, customer lists are easily accessible to you! Create marketing campaign and measure their success with marketing reports.